Teaching Blog Round Up: Countdown to Winter Break! Plus a Holiday Freebie! Countdown to Winter Break! Plus a Holiday Freebie! Hi everyone! It's Angie here from The First Grade Scoop. How many of you are counting down the days until winter break?! We used to have three glorious weeks that would start today at 2:45, but we had our calendar changed and we're back to the normal two week break. That means five more days for us, filled with a winter assembly and rehearsals, a holiday party, pizza fundraiser, and movie. YIKES! I don't know about you, but once our calendar changed to December and my kiddos saw the "Christmas" label on the 25th, they started to go NUTS! Behavior hasn't been at its greatest, so I made a little something to help celebrate the kids who are doing what's right. I'm too cheap to buy an Elf on the Shelf for my classroom, and I couldn't find a cheaper substitute, so we have a "mystery elf" who appears overnight when the students are away. 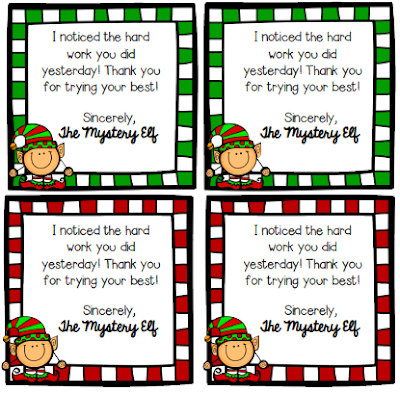 I had to feign surprise big time when they spotted one of these little notes from the elf himself (or herself)! A quick print and cut and they're ready to go! (Don't you just love the frames? They're from Krista Wallden... Adorable, right?) The elf leaves them on students' desks overnight, along with a peppermint patty and a little silver glitter... And the kids are just SOOO pumped about it. It's the little things, right? If you'd like a copy of the elf notes, just click the image above. Hope you all have a safe and happy holidays! See you next month!